The Canon EF 800 L super telephoto is as impressive a lens as I have ever used. First released in 2007/8, it benefits from being designed from the outset to be used with digital camera bodies. The EF 800 L works well when used with a monopod. It remains the longest freely available lens in Canon’s line-up, although at the time of this writing a Nikon equivalent of this lens has been announced but has not yet materialized. The EF 800 L is a lens that I don’t encounter in the field too often, but it certainly is a powerful tool for certain types of photography. Despite its design, which is already a few years old, the EF 800L looks very modern and sleek. 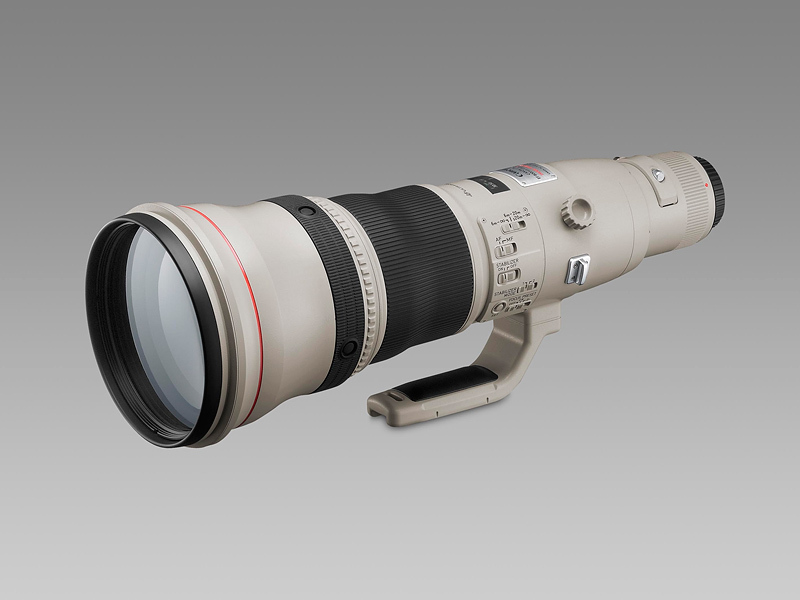 In this regard, it resembles the newest Canon super telephoto lenses a little more closely than the older telephoto designs like the Canon EF 600L f/4.0 IS and EF 500L f/4.0 IS (first versions). The lens mount is the standard metal Canon EF mount and is fitted with a rubber O-ring to provide a weather-proof seal at the camera/lens mount. There is a ridged section at the lens base, to make it easy to grip the lens when it is being mounted or removed from a camera body. A drop-in filter holder that slides into a slot in the top of the lens barrel houses a clear element that Canon states should remain in place for best optical performance, unless replaced with a different filter glass. There is a broad circular section of the lens barrel that makes up the tripod mount collar, and it is an integral part of the lens barrel. There is a locking knob on the top right side of the lens for locking the collar in position. The collar rotates very smoothly and has very useful detents at 90 degree positions which can be heard and felt. The tripod foot itself bolts fast to a protruding section of this collar. This particular tripod foot extends quite far away from the lens body, which is good, and is long and padded on top. It makes a great handle when carrying or handling the lens. There is an attachment point on each side of the lens barrel for the attachment of the carrying strap. The EF 800L as seen from the side. A distance scale is positioned right on the top of the lens. There is one large switch panel on the left side of the lens. It houses controls for focus distance limits, autofocus, image stabilization and the focus preset function. Ahead of these controls there is a very wide focus ring. The ring is so wide that it is actually tapered outward as the lens diameter increases. A narrow metal playback ring with a ridged edge is located just in front of the focus ring. It is used as the main control for the focus preset function. There are four buttons arranged around a black rubber ring that function as AF stop buttons. The four buttons all perform the same function, but they are spread evenly around the ring so that it is always easy to locate at least one of them whilst shooting. Depending on which camera body you are using with the EF 800L, these buttons can also be programed to perform other functions that you might prefer. The lens hood mounts quite firmly with a thumbscrew that locks it into place on the end of the lens. The hood is large, and very deep, and provides a very high degree of physical protection for the front element of the lens. The hood has a series of tiny screws that attach it to its base, and they have a tendency to come loose over time. I usually get the threads coated with a mild thread adhesive before re-inserting, courtesy of Raymond at Cameratek. That seems to keep them snug. There is a black, leather-like lens cap designed to protect the front element from damage when not in use. It is secured by means of a drawstring. It is very effective for storage and when carrying the lens around but it is quite difficult to put on or take off in a hurry. The Canon EF 800 L from its right side. Inside the magnesium alloy casing, the EF 800 L houses some very high quality optical components. There are 18 elements arranged in 14 groups. Two of the elements are made from fluorite. Flourite is highly effective at combating chromatic aberrations as well as controlling flaring and ghosting. It weighs less than some other materials used for making optics and is extremely costly to manufacture. There is also one UD (Ultra Low Dispersion) element and a single Super UD (Ultra Low Dispersion) element in the lens make-up. The very front element of the lens serves more of a protective function, and is relatively inexpensive. Should it get damaged it can be easily replaced. There are 8 aperture blades in the diaphragm. Although it is a very big lens, the EF 800L f/5.6 is not excessively heavy, and tips the scales at 4500g without the lens hood, which weighs a further 290g. Compare this to Canon’s outgoing EF 600 L f/4.0 IS which weighs 5360g without the hood. The lens has no moving parts that project beyond the lens barrel, and is weather-sealed to a high degree, with seals and gaskets fitted throughout. Build quality is exceptional, with seams and edges, and all fittings perfectly well-finished. The white paint coating the lens is also durable, and helps reflect heat when shooting in the sun. The EF 800L is supplied together with the lockable Canon lens case 800, which is a great place to store the lens or to transport it (although not ideal for in-cabin storage). The lens case provides serious protection for the lens when not in use. 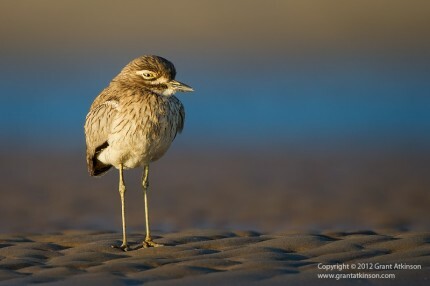 Water thick-knee. Canon EF 800L f/5.6 IS, Canon 1Dmk4. Shutter speed 1/1250s at f/5.6, Iso 640. First impression is that the lens is not as heavy as you might expect, given its length. It is a large telephoto lens though, and if you are new to using such a big lens, there are a number of things that may take a little time to get used to. If you are not overly experienced at shooting lenses with such a long focal length, it might be best to start off by shooting the lens on a sturdy tripod or some other type of solid mount. One reason for this is that the EF800L has a very narrow field of view, and it can be quite difficult to locate your subject in the viewfinder. If you are trying to do this whilst the lens is not steady, it will be doubly difficult, especially as any motion is magnified greatly. The same goes with getting the lens properly focused. Make sure the focus distance limiter on the side of the lens is set to the correct distance range for your intended target subject. Also make sure that whichever Canon camera you are using has the Custom Function for Focus Search set to On. For its part, the EF 800L f/5.6 IS USM focuses quickly and accurately. With such a long focal length, a lens like this can also get quite far out of focus if you lose focus on your subject. The lens can end up moving its focus back and forth a few times before locking onto a target again. This is known as hunting. There are several things that you can do to minimize hunting. Some photographers like to turn the focus ring, manually overriding the lens autofocus, until they can see the subject coming clear in the frame, and then switch back to autofocus for fine-tuning. I use a different method. If I lose focus on a subject, and I cannot see it in the viewfinder clearly, I just aim the lens at something prominent, and high in contrast, that is roughly the same distance away from me as the subject, and press the shutter halfway to activate autofocus. This gets the lens focused near enough to my subject that I should then easily be able to place an autofocus point on the subject itself and make a second autofocus adjustment. If I am shooting subjects that are not moving away or toward me too much, I will identify a couple of high contrast focus targets even before I start shooting, just for this purpose. A good example of this technique would be a focusing on a branch beforehand that I might be expecting a bird to fly to and from. Of course, once you have been shooting with this lens or one like it for a while, getting your subject framed quickly and in-focus just becomes instinctive. Canon 1Dmk4, Canon EF 800 L f5.6. Shutter speed 1/3200sec at f/5.6. Iso 400. Handheld. The EF 800L f/5.6 is not that heavy that it cannot be handheld. I am very small of stature and am still able to shoot it handheld for a few minutes at a time, or certainly for a few frames when I need to. More robust photographers than I do shoot the lens handheld for longer periods with great success. However, you do need to be quite skilled for that type of shooting, as the bulk and weight of the lens make it a little difficult to make use of the actual controls on the side of the lens whilst handholding. It is hard not to be excited when shooting with a native focal length of 800mm, especially when the lens itself works so very well. Autofocus is quiet, quick and accurate, the controls are well-placed, and the image stabilization is effective. I used the EF 800L on the following dslr bodies: Canon 1Dmk4, 1Dmk3, 5Dmk2 and 60D. 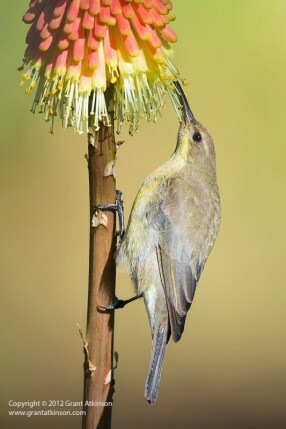 Malachite sunbird, female. Canon 60D, Canon EF 800 L. Shutter speed 1/500sec at f/5.6, Iso 500. Autofocus was accurate and fast on all of the bodies, though both of the 1D bodies drove the lens noticeably quicker than the smaller bodies. The EF 800L does not focus quite as quickly as some of other Canon fixed lenses with maximum apertures of f/4.0. There are definite benefits to be had from making use of the focus distance limit switches on the side of the lens. Minimizing the amount of travel that the lens elements have to move through to find focus will speed up the autofocus operation. Closest focus distance is around 6m, which is not that close. In some instances, where my subject was too small at that distance for a proper frame, I chose to switch from a camera with a full-frame sensor (the 5Dmk2) to a camera with a smaller sensor and a higher pixel density (Canon 60D). This enabled me to end up with a larger subject in my final image. On a 60D or 7D, field of view crop is equivalent to what you would see at focal length of 1280mm. 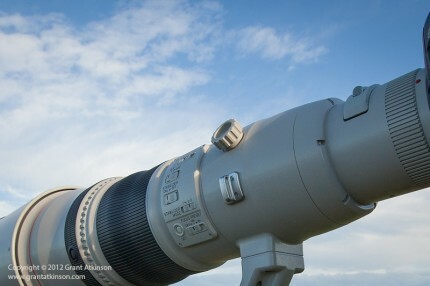 I found the reach provided by this lens to be excellent for bird photography. It is also a very effective tool when photographing in places where it is not possible to get too close to one’s subjects. Shooting from further away can also be beneficial in that many subjects will continue with their natural behaviour, rather than changing what they were doing due to the presence of a photographer. The long focal length also allows one to photograph creatures that might otherwise be a little shy, and are intolerant of close approaches. At close range, the EF 800 L is also very good for incredibly detailed portraits of wildlife with fantastic bokeh. Another positive characteristic of images taken with such a long telephoto lens is that it flattens out perspective. This lens is fitted with an IS system that is equivalent to four stops of shutter speed. I found it very useful when shooting the lens handheld, or from a resting support like a beanbag on the car door, and when shooting from a boat. The EF 800 L is one of the last of Canons L series lenses to still have the ‘old’ style switches for IS and AF. What this means is that they protrude slightly, and it is easy to shift a switch inadvertently, especially when handling the lens whilst carrying it. Take care to make sure that the switches are in their desired positions before shooting. 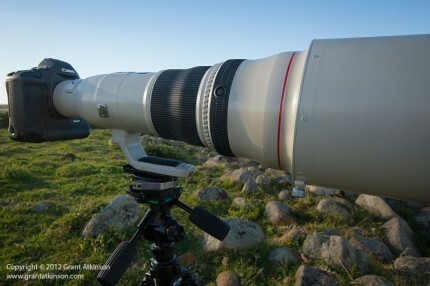 Canon claim that the IS system in this lens will automatically detect when the lens is mounted on a tripod. They also claim that the IS is beneficial even on a tripod, to help deal with even the slightest camera shake or vibration. Many shooters prefer to turn IS off when they are shooting from a tripod, or at shutter speeds over 1/1000sec, and this is still an option. I generally prefer to keep the IS on and have not had reason to change this. I usually switch it to Mode 2 for tripod shooting. Unlike Canon’s latest telephoto lenses, the EF 800L does not have a Mode 3. One other thing to remember when handling this lens is the hood. Whilst it attaches firmly, the locking knob does protrude somewhat from the side of the hood, and care should be taken not to let it hang up on things. Optically the EF 800 L f/5.6 is about as good as any Canon telephoto lens that I have used. Water thick-knee. Canon 1Dmk4, Canon EF 800 L f/5.6. Shutter speed 1/640 at f/6.3. Iso 800. 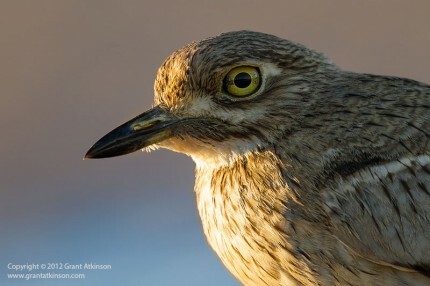 The portrait of the water thick knee immediately above is a 7mp crop from a 16mp file, shot into the sun. Despite that, the image is sharp, and full of contrast. The images I have obtained from this long lens are hard to tell apart from those taken with my own EF 300 L f/2.8 IS. Sharpness, colour and contrast are exceptional. The amount of detail in some of the images I have obtained with this lens is incredible. The bokeh is as good as it gets, and it gives the photographer lots of creative control when it comes to background blur. I spent much of the time shooting the EF 800L wide open at f/5.6, and can honestly say that it was exceptionally sharp at that aperture setting and it was hardly worthwhile stopping down for extra sharpness. Colour fringing and other CA’s are minimal, and what little there is when shooting in high-contrast conditions can be easily removed in processing. Vignetting is something that is a bit more prevalent in images from the EF800 L, especially when the background is uniform. The vignetting fades away when the lens is stopped down. However, even wide-open, the level is not excessive, and again, it is very easily removed in Adobe Lightroom or Adobe Photoshop. Full-frame shooters will notice it much more than those using the lens with cameras that have smaller sensors. 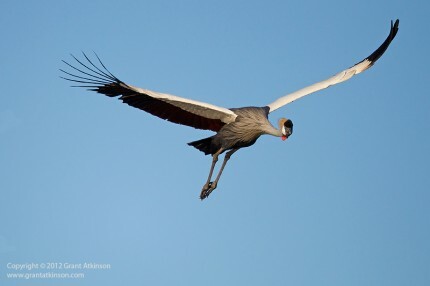 For a wildlife shooter like myself, the vignetting was only field relevant when photographing birds in a clear sky, and even then it was easily removed in processing. My evaluation of the image quality of the lens was carried out whilst shooting in raw, and processing in Adobe Camera Raw and Photoshop. Another factor to consider when using this lens is the impact that the long focal length and high optical performance has on image quality. The fact that it really allows the photographer to get enough pixels on the subject means less need for cropping, and this equates to improved image quality. The EF 800 L f.5/6 IS USM is compatible with Canon extenders. As this reduces the maximum aperture to the point where only 1D and 5D3 bodies will still be able to carry out AF, I did not shoot the lens in this way. For those times when the EF 800L was not long enough for the job, I chose to make use of different camera bodies with smaller pixel pitches/and or a crop sensor, in order to get more pixels on my subject. The steady improvement in image quality from camera sensors, especially at higher iso settings, also has relevance for the EF 800 L f/5.6 with its modest maximum aperture. Shooting at higher iso settings is a reality with many of the better dslr cameras, and this enables photographers to still get fast enough shutter speeds, despite ‘only’ being able to open the aperture to f/5.6. One mp crop from 18mp original file, Canon 60D and Canon EF 800L wide open. Shutter speed 1/500sec at f/5.6, Iso 500. 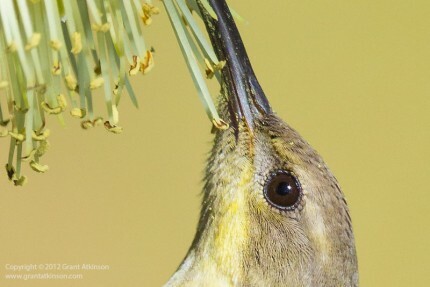 The extreme crop above of the female sunbird is just one mp in resolution, taken from an 18mp original file. I included this crop to give an idea of the detail to be found in files captured with the EF 800L. I tried to shoot fast shutter speeds whenever the light allowed. Although the EF 800 L is the only 8oomm focal length lens that Canon make, there are some options. The latest Canon EF 600 L f/4 IS II has even better image quality, is lighter at 3920g without hood, focuses faster and has a larger maximum aperture. It gives up 200mm of focal length though, but it can be very effectively used with the Canon EF 1.4x III extender. With this extender in place the combination is an effective 840mm f/5.6 max aperture lens, with image quality still good, and AF speed and accuracy very slightly degraded by the extender. This is a more versatile setup than the EF 800L is on its own, as you can take the extender off for improved low light and AF performance. 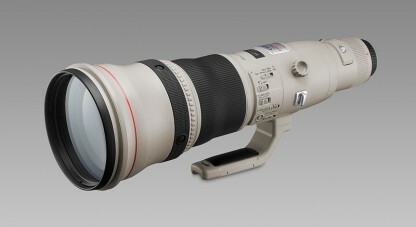 Another option is the Canon EF 400 L f2.8 IS II, which weighs just 3850g without the hood. Fitted with the Canon EF 2.0x III extender it becomes an effective 800 f5.6 lens, although the image quality and AF performance are likely to be a little more degraded by the use of the 2x converter. This setup also offers options though, by removing the extender the bare lens offers all the benefits of a fast f2.8 maximum aperture and lightning fast AF response, even though it then gives up 400mm of focal length. Cost will also come into play when deciding which might be the best choice for you between these three lenses. Canons outgoing EF 600 L f4 IS is also a fantastic lens, though heavier than all of the lenses listed above. 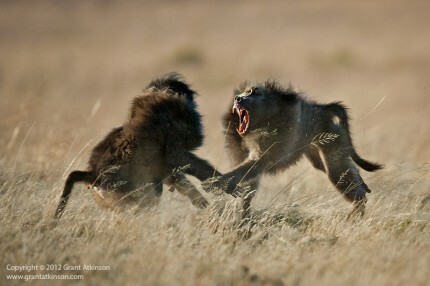 Chacma baboons. Canon 1Dmk3, Canon EF 800 L. Shutter speed 1/1600second at f/5.6. Iso 400. Handheld. The Canon EF 800 L f/5.6 IS USM rewards good technique with incredibly good image quality. The focal length enables you to capture shots that you might not have thought possible before. It is a big, impressively constructed and expensive piece of gear to own. It requires a certain skill level to deliver the best results, but it is exciting to use and it delivers the goods when it comes to high-quality images. A speciality lens best suited to wildlife photographers or those who have need of lots of focal length in their photographic requirements. 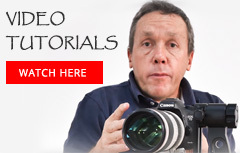 I have no hesitation in recommending this lens for the use it was designed for. Another great review, thanks Grant. This lens really is a monster! Thanks for commenting Johan. It is a bit of a monster, but much easier than the older 600f4 IS to carry and handle. I would definitely consider the 800 as a rental option for photo assignments where lots of focal length is essential. Enjoyable and comprehensive reading. I was gob smacked reading that you used this on a boat, how to keep your balance and aim the monster must be fun to watch. Another well-written review, Grant. I am personally excited about the Nikon variant of this lens coming out soon (though I won’t be able to buy one). Loving the new look of your site and the integrated blog. Good job. Thanks Morkel, I hope that you get to make use of the 800mm Nikon, even if you dont get to own one! The EOS 5D mark III will NOT focus with this lens when a 1.4x Extender is attached! A firmware upgrade to make this camera focus at f/8 was announced recently, but will not be available before May 2013. Right now, only the 1D series will focus with that combo. Thanks Johan, that is my mistake in the text…good to point it out. Thanks for yet another objective review. I know you are a canon man but if you want to do yourself a favour, try and test the Sigma 300-800 5.6.
in my humble oppinion, it is a more than worth wile alternative to the 800 fixed from canon, and I would like to hear your verdict! Hi Guido, thanks for the feedback!. 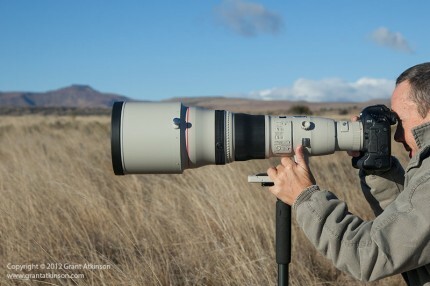 I have seen the Sigma 300-800mm lens but not had a chance to use it myself, and it isn’t an easy lens to get hold of here in South Africa :-). I do have two photographers that I take on photo trips who use it and they both enjoyed its reach and versatile focal length range a whole lot!